The Spot Delivery is a Los Angeles delivery that is strongly convinced that patients should have easy access to medical cannabis products like to any other medicine. Boasting of excellent delivery service, the company will ship the order as soon as it is placed and processed. The Spot Delivery distributes to such areas like Glendale, Hollywood, Korea town, Pasadena, Silverlake, Studio City, Ventura, and others. Please contact the personnel to know if the order can be shipped to your place. The minimum order amount is $40, however, orders are not charged a delivery fee. All customers must present their doctor's recommendations and state-issued IDs. 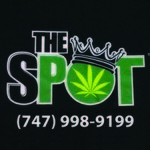 The Spot Delivery offers a tremendously large assortment of medical marijuana: there 20 grades of Hybrid, almost 50 grades of Indica and 20 grades of Sativa strains. Those who prefer non-smoking methods of ingestion will find here a number of extracts and edibles. All plants and ingredients have been carefully selected to help patients deal with health problems. The budtenders will be glad to help patients choose the proper medication based on their personal needs.